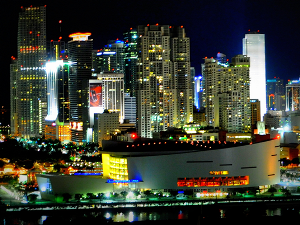 Downtown is a major business district and in recent years has been the fastest growing area in Miami. With large high-rise construction and population increase, Downtown houses some of the oldest buildings in the city as well as major museums, parks, courthouses, government headquarters, retail venues, banks, and theaters. Brickell, located in Downtown Miami, has grown to become one of the largest financial districts in the United States. Along Brickell Avenue, one will find the largest concentration of international banks in the United States. Brickell also has most of the state’s foreign consulates, most of which are also located on Brickell Avenue. Aside from being relatively close to Miami International Airport and being centrally located in the City of Miami, Brickell is a prime hot spot filled with exceptional restaurants, zestful nightlife, and ritzy hotels that are frequently visited by many celebrities and A-Listers. In addition to the typical commuter cars, taxis, and public buses, Brickell, like the rest of Downtown Miami, ahs access to the Metromover. This free mode of transportation is one of, if not the most popular mode of transportation for working people and residents of Brickell. Many celebrate Brickell for its prime location. Its proximity to South Beach is a great convenience and the ability to enjoy the Miami-chic nightlife without the partying and commotion of the Beach is also a nice perk.